left the packet at Rome to go on to their home in Westmoreland, New York, I was interested enough to ask if I might write to her. I had not been in good health for some time; indeed as I look back there was a good deal of what was called malaria and ague and fever in my early experience. It seems probable that one reason for these illnesses was lack of a properly balanced diet. One of the most severe attacks I had was some years later when a series of boils ended by an infection settling in one knee which has always since been slightly stiffened and one leg has been a trifle shorter than the other. The result of this was that I was rejected when I tried, to enlist for service in the Civil War. 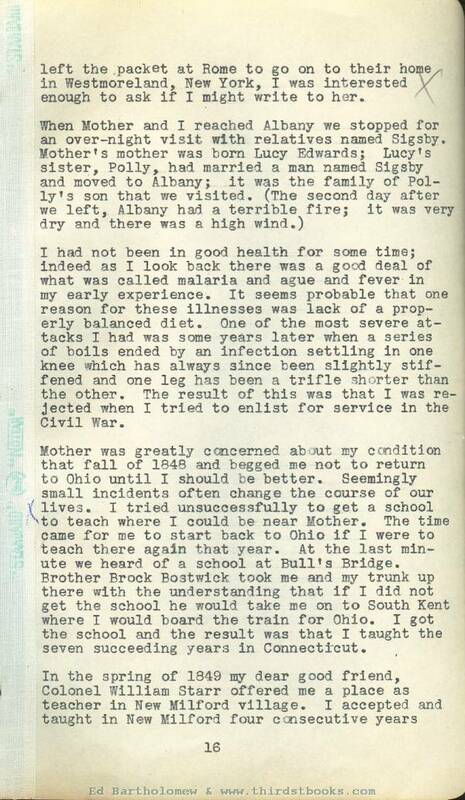 Mother was greatly concerned about my condition that fall of 1848 and begged me not to return to Ohio until I should be better. Seemingly small incidents often change the course of our lives. I tried unsuccessfully to get a school to teach where I could be near Mother. The time came for me to start back to Ohio if I were to teach there again that year. At the last minute we heard of a school at Bull's Bridge. Brother Brock Bostwick took me and my trunk up there with the understanding that if I did not get the school he would take me on to South Kent where I would board the train for Ohio. I got the school and the result was that I taught the seven succeeding years in Connecticut. attending the State Normal School at New Britain and finishing the course there in the summer of 1852. Three of the four years in New Milford village I lived in the home of Colonel Starr and have never forgotten his kindness and friendly encouragement. 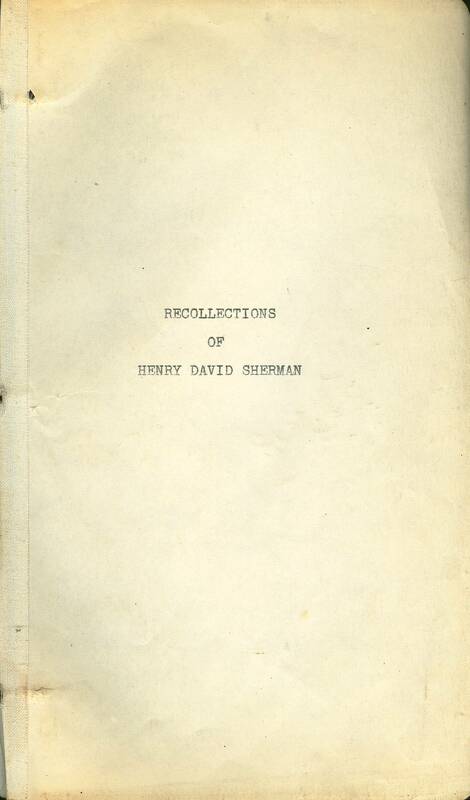 While teaching in New Milford, in the summer of 1849 I visited Grandfather and Grandmother Sherman in Fairfield, Vermont. Grandfather died the following year, June I3, 1850, and the uncle who had been so kind to me, David Main, also died in 1850. During the Christmas vacation of 1850 and 51 and again in the summer of 1851 I visited in Westmoreland, New York, in the home of Miss Tompkins. 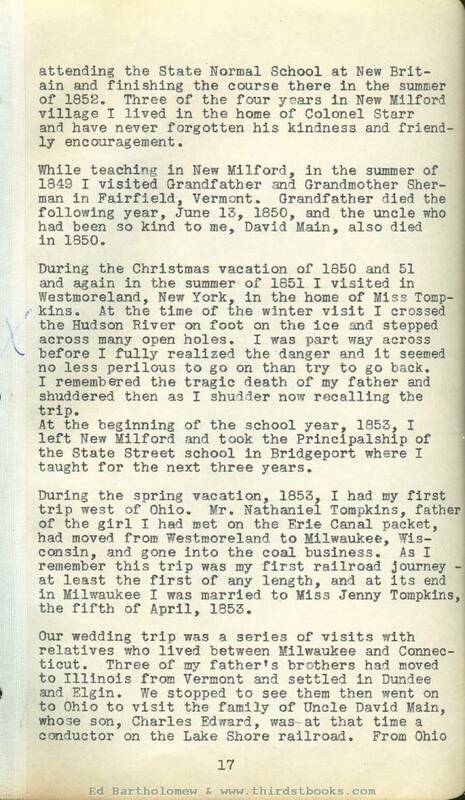 At the time of the winter visit I crossed the Hudson River on foot on the ice and stepped across many open holes. I was part way across before I fully realized the danger and it seemed no less perilous to go on than try to go back. I remembered the tragic death of my father and shuddered then as I shudder now recalling the trip. At the beginning of the school year, 1853, I left New Milford and took the Principalship of the State Street school in Bridgeport where I taught for the next three years. During the spring vacation, 1853, I had my first trip west of Ohio. Mr. Nathaniel Tompkins, father of the girl I had met on the Erie Canal packet, had moved, from Westmoreland to Milwaukee, Wisconsin, and gone into the coal business. As I remember this trip was my first railroad journey - at least the first of any length, and at its end in Milwaukee I was married to Miss Jenny Tompkins, the fifth of April, 1853.
we went to Westmoreland, New York, for a brief visit with Mrs. Ford, my wife’s aunt, a fine able woman who was one of the first woman physicians of the country. Our daughter, Albertine, was born while I was teaching in Bridgeport, September 18, 1855. I had become much interested in Masonry while teaching in New Milford and during the years in Bridgeport I was active in Jerusalem Chapter, St. Peter’s Lodge and in St. John’s Lodge. 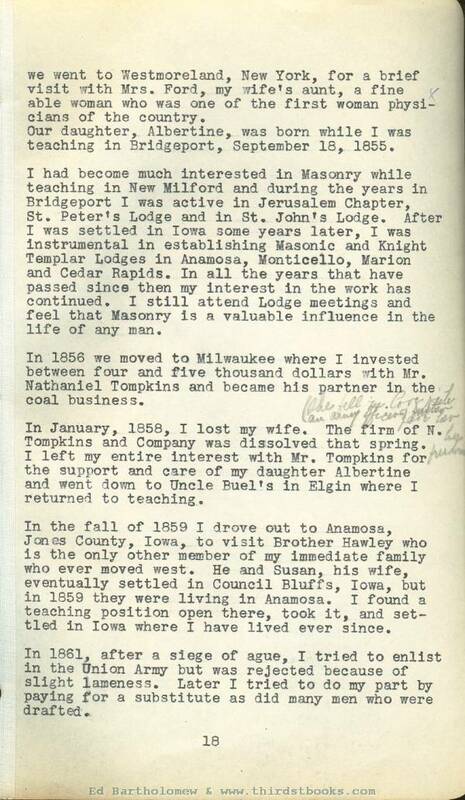 After I was settled in Iowa some years later, I was instrumental in establishing Masonic and Knight Templar Lodges in Anamosa, Monticello, Marion and Cedar Rapids. In all the years that have passed since then my interest in the work has continued, I still attend Lodge meetings and feel that Masonry is a valuable influence in the life of any man. In 1856 we moved to Milwaukee where I Invested between four and five thousand dollars with Mr. Nathaniel Tompkins and became his partner in the coal business. In January, 1858, I lost my wife. The firm of N. Tompkins and Company was dissolved that spring. I left my entire Interest with Mr. Tompkins for the support and care of my daughter Albertine and went down to Uncle Buel's in Elgin where I returned to teaching. In the fall of 1859 I drove out to Anamosa, Jones County, lowa, to visit Brother Hawley who is the only other member of my immediate family who ever moved west. He and Susan, his wife, eventually settled in Council Bluffs, Iowa, but in 1859 they were living in Anamosa. I found a teaching position open there, took it, and settled in Iowa where I have lived ever since. In 1861, after a siege of ague, I tried to enlist in the Union Army but was rejected because of slight lameness. Later I tried to do my part by paying for a substitute as did many men who were drafted. That spring was the beginning of thirty years of activity along many lines. I was thirty-eight years old but had perhaps matured later than many men because each step ahead had been slow; I was twenty-eight when I finished my studies at the State Normal School in New Britain. Now, my wife’s interests and mine were along the same lines. 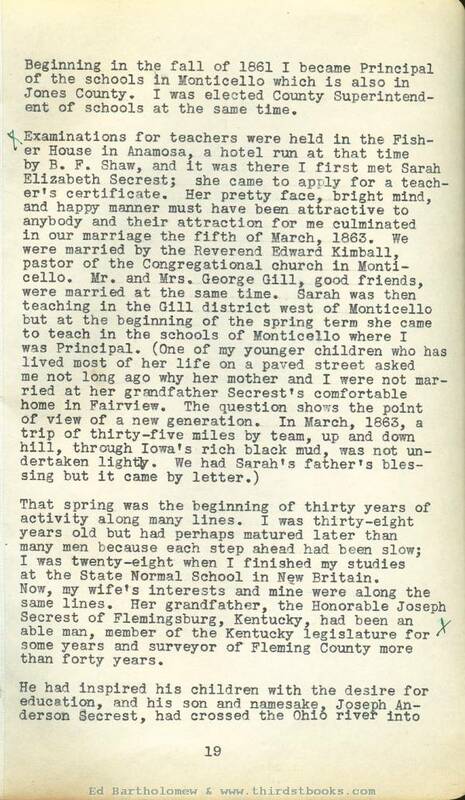 Her grandfather, the Honorable Joseph Secrest of Flemingsburg, Kentucky, had been an able man, member of the Kentucky legislature for some years and surveyor of Fleming County more than forty years. Indiana where he obtained the best schooling that was available in that part of the country. He prepared himself to teach - music as well as other branches, and he and his young wife, Margaret MacClain, a girl from Shelby County, Kentucky, migrated to Iowa before 1845. They went to Jones County because Cornelius Mershon, a brother of Joseph Anderson's mother, had preceded them and was living at Highland Grove. 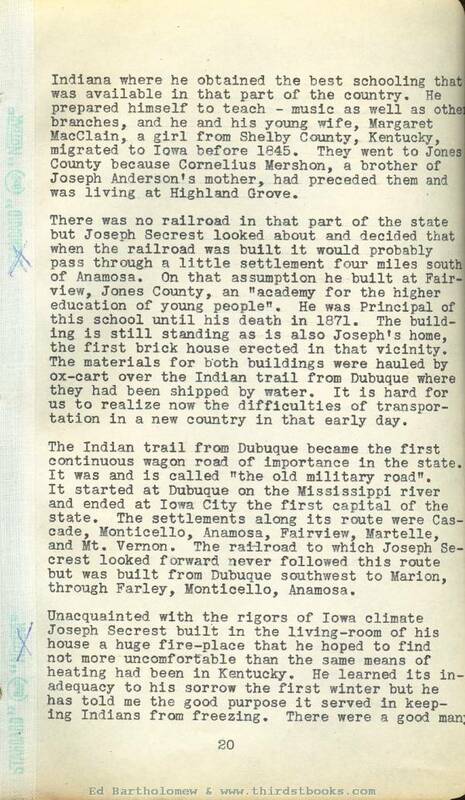 There was no railroad in that part of the state but Joseph Secrest looked about and decided that when the railroad was built it would probably pass through a little settlement four miles south of Anamosa. On that assumption he built at Fairview, Jones County, an "academy for the higher education of young people". He was Principal of this school until his death in 1871. The building is still standing as is also Joseph's home, the first brick house erected in that vicinity. The materials for both buildings were hauled by ox-cart over the Indian trail from Dubuque where they had been shipped by water. It is hard for us to realize now the difficulties of transportation in a new country in that early day. The Indian trail from Dubuque became the first continuous wagon road of importance in the state. It was and is called "the old military road". It started at Dubuque on the Mississippi river and ended at Iowa City the first capital of the state. The settlements along its route were Cascade, Monticello, Anamosa, Fairview, Martelle, and Mt. Vernon. The railroad to which Joseph Secrest looked forward never followed this route but was built from Dubuque southwest to Marion, through Parley, Monticello, Anamosa.